Kosa P, Ghazali D, Tanigawa M, Barbour C, Cortese I, Kelley W, Snyder B, Ohayon J, Fenton K, Lehky T, Wu T, Greenwood M, Nair G, Bielekova B. Development of a Sensitive Outcome for Economical Drug Screening for Progressive Multiple Sclerosis Treatment.Front Neurol. 2016157:131. doi: 10.3389/fneur.2016.00131. eCollection 2016. Correlation matrix for 14 clinical and MRI measures in the cohort of 98 progressive MS patients. 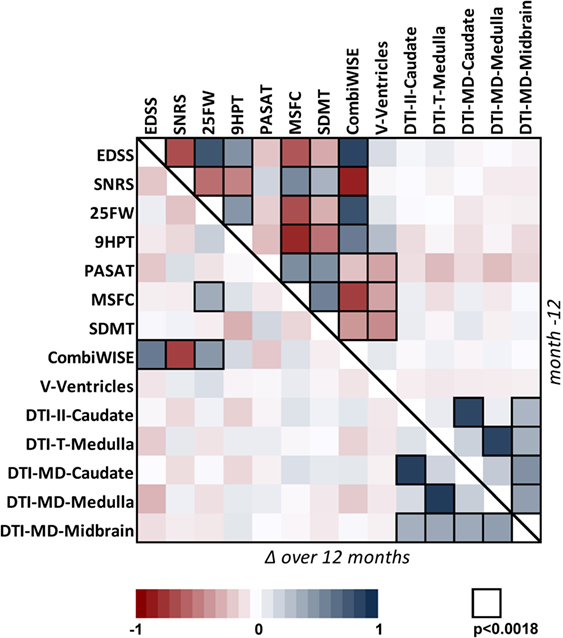 Correlation matrix for Mo −12 cross-sectional data (above the diagonal) and relative percentage change (Δ) over 1 year (below the diagonal) in the progressive MS cohort. The heatmap shows positive (shades of blue) and negative (shades of red) Spearman correlations. It took neuros quite a few years to work out a trial design and find drugs that affect relapsing remitting MS. With MRI one can get a fair idea of an efficacious drug after about 6 months now. Progressive MS studies are still struggling to find effective treatments and studies currently take agents to recruit and complete. Waiting for EDSS (motility scale) to change can take a long time in progressive MS. The imagers have been arguing for brain and spinal cord volume loss as an outcome, but we know that this outcome can fall foul of tissue swelling and is often missing the iceberg under the tip. In this study they put imaging to the test as a method to detect progression and they put most of them to the sword. This is not surprising to me because ,we don’t really know what many of the imaging outcomes are actually detecting in relation to patholgy. When they looked at a number of measures, some showed progression over the year of analysis, including EDSS, Brain atrophy and 25m walk, but it was not all consisent. So compared to EDSS, trials using CombiWISE as an endpoint would need half the participants. However, the regulators are a narrow-minded bunch of individuals who are resistant to change, so would they accept this? I am not sure. There remains a large unmet need for development of therapies for progressive MS. While at any given time, multiple candidate therapies are available, the present bottleneck resides in the inability to screen them in small, but adequately powered, Phase II trials that can correctly predict efficacy on FDA-accepted clinical endpoint utilized for Phase III trials. This study provides a comparison of outcomes in the same patient group(s) within a real-world situation of Phase II clinical trials. EDSS represents only 28% of the CombiWISE score, and CombiWISE is more than twice as sensitive as EDSS in detecting progression of disability lies in the discreteness of EDSS: while a patient may remain on any given EDSS step for a long time, CombiWISE can detect continuous disease progression as measured by three alternative clinical scales. CombiWISE has consistently higher sensitivity for detecting longitudinal changes in progressive MS in comparison to MRI measures of brain atrophy, currently broadly utilized in Phase II progressive MS trials. In contrast to all tested MRI measures, CombiWISE can predict changes in EDSS, presently used for regulatory approval. 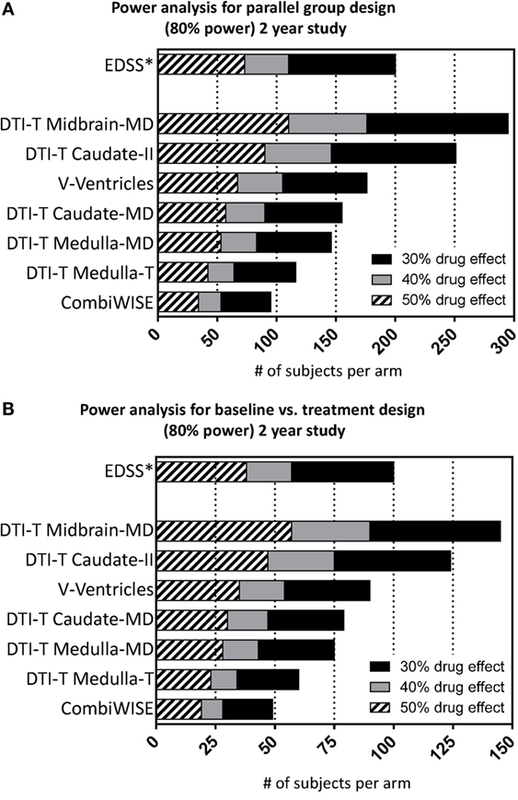 Substituting EDSS with CombiWISE requires over 100 fewer subjects per arm (200 versus 95) in a parallel-group design to detect a 30% drug effect in a 2-year study. ProfG may want to comment on this but he has been banging his head against a preverbial wall when it comes to use of the EDSS as an endpoint for trials as it is slowing progresss. He has said so many times that the EDSS needs to be replaced as primary endpoint with more responsive and sensitive measures. It will be interesting to see if Combiwise full fills the role of a major primary endpoint and it would be great to see re analysis of past progressive trials using the Combiwise outcomes to see if failure becomes success. Maybe they can get their hands on the natalizumab, fingolimod, ocreluzimab trials and have a look. Well what the matter with the regulators? You can use this metric in phase II, and then fallback to regulator-recognised EDSS in phase III adjusting the size and duration according to known discrepancy in sensitivity. Combiwise may work for trials but the fact that it includes the EDSS is a problem. i find it amazing that neurologists haven't risen up as a body and junked the EDSS in favour of something that actually tells you how PWMS are doing. To use myself as an example of what rubbish the EDSS is, over the past three years, I have lost my ability to cycle, to drive, to cut up raw food (so I can no longer cook) and to write more than a few words by hand. On most days, I can walk shortish distances with two sticks but on bad days, I need a walking frame – I never needed a frame three years ago. I was 6.5 on the EDSS three years ago and I'm 6.5 on the EDSS now. A timed 10 metre walk, with a note of the walking aids needed, and a well designed hand function questionnaire could easily capture the changes in function that I've seen. The EDSS doesn't even begin to do so Have any readers of this blog got ideas about how to get neurologists to replace the EDSS with something more sensible? The worsening without remission, it is easier to see this retrospectivly but relapsing actively is often superimposed on SPMS. So the DMT may block relapses but not the SPMS. The ASCEND study showed natalizumab failed to halt progression of symptoms in SPMS so there are some elements of disease it does not stop, likewise studies showed that people continue to progress on alemtuzumab however would it change the rate of worsening. We would need a trial to address this. lol just to recap: using EDSS as a primary end-point of clinical trials is slowing progress. Using EDSS to help people with MS track down their symptoms and disabilities is also useless because it is not linear, it is too confusing and subjective, the score depends on day to day functioning fluctations and two neuros can come up with a different score for the same patient. In other words, it doesn't help patients, it doesn't help progress, it makes little logical sense – but we should keep it because it's internationally recognised lol. Logic of our world: it's useless and it doesn't help but let's keep it cos everyone knows it. While we're discussing stuff that obscures what's going on with people with MS, rather than helps anyone (doctors or patients) to understand, let's start a campaign to junk the labels 'relapsing-remitting', 'secondary progressive' and 'primary progressive'. Let's start talking about inflammatory activity and nerve death instead. No-one agrees who has got RRMS, or SP or PP. Can you see a consistent improvement in your physical condition when you've got a progressive form of MS? Do you see a worsening in your physical condition when you've got over a relapse, if you've got RRMS? The neurologists don't agree on these fundamental questions and that's because the labels are of no use. Start telling patients whether they're experiencing inflammatory activity or nerve death or both. Start doing drug trials on people who are experiencing inflammatory activity or nerve death or both. Junk the useless labels. I agree. The obsession with cagorisation is one which crops up in endeavours to understand the fiendishly complicated. In some applications, such as categorising species, it's useful. It is not useful to apply artificial categories to the MS spectrum. That should be clear now. In terms of treatment, the only really important question at present is whether there is treatable inflammation. Because there is nothing for progression so far. That is not actually true. 80mg a day of Simvastatin has been shown to reduce brain shrinkage by 45% over a year, compared to placebo, in Phase II trials. I believe, and I think that the neurologists believe, that brain shrinkage comes from nerve death. Ergo Simvastatin reduces nerve death (i.e. reduces MS progression). There is at least one other trial going on of repurposed drugs, testing whether they reduce brain shrinkage. I don't know whether they included that it the tests of Ocrelizumab, or whether they were just looking at whether it reduced inflammation. Are you sayng that there are two different mechanisms for nerve death? I thought progression in MS was caused by nerve death, so if you find a drug that slows nerve death, you have found a drug that slows progression. I was contradicting the anonymous person who said there are no drugs for progression. That's very interesting. But it still doesn't make the labels PP, SP and RR useful, unless there is one set of pathways to nerve death mapping on to each of the labels. And that just can't be true, because different neurologists come up with different labels for the same person's MS (amongst many other reasons). Genomics – a new crystal ball for predicting the course of MS?